Video for Radio, has never been simpler. Interested in HDVmixer? We have engineers on speed dial. Give us a call, and BSW can take care of the rest. HDVmixer can increase your social media engagement! Views, clicks, likes, and the like! Click here to see BSW/HDVmixer's case study on Social Media analytics with WORX 96.7FM in Madison, IN. Nowadays audiences demand visual content even from radio stations. HDVMixer allows broadcasters to produce appealing professional video content effortlessly. Visual radio thought as a TV studio inside a radio station is cumbersome and a barely profitable approach. The HDVMixer Visual Radio solution is what broadcasters have been dreaming of. HDVMixer is an add-on video server which runs separately from the station’s radio automation system. Situational awareness and video automation are accomplished via HDVMixer’s SmartCAM interface box; providing the studio with: 8x audio console mic fader status input(GPI) 6x microphone (post preamp) audio level meter 3rd party radio automation software metadata input HDVMixer is compatible with most radio automation solutions in the market including: Enco, Dalet, FLEX, RCS and WideOrbit. • 3 16ft USB active extension cable. • 3 HDV-CS table camera mount. • Flexible Video Input - 3 through 9 video sources (multiple formats). • Built-in Video Encoder - Streams directly to your favorite CDN. • Multi-CDN Capable - Streams to multiple CDNs simultaneously. 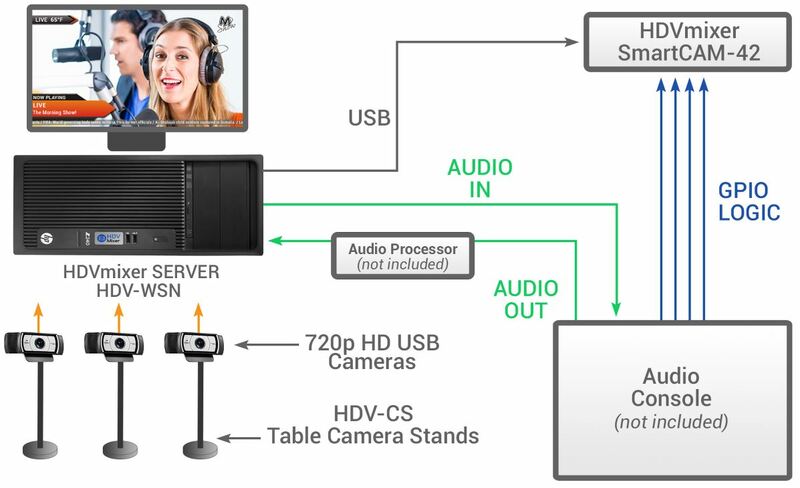 • Embedded Video Transcoder - Simultaneous 720p, 480p, 320p streaming. • HD Video Program Output - Feeds cable TV, DTV networks, studio TVs. • Video Call Integration - Captures call video (Skype, Google Hangouts, etc). • Video on Demand - Video recorder for VOD upload to Youtube/Web. • Social Media Integration - Twitter feeds & Instagram overlays. • On Screen News Crawl - Updated automatically via RSS feed. • RTMP Video Feed - External RTMP streams can be used as video sources. • PTZ Camera Automation - PTZ presets trigger recorded movement sequences. • Remote PC Desktop Grabber - Grab any PC screen in real-time via WiFi.